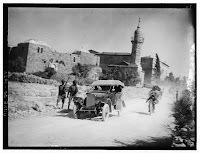 The Jaffa Gate of Jerusalem's Old City faces west to Jaffa. 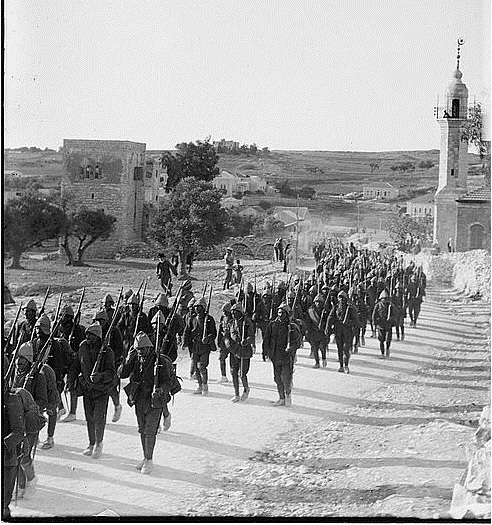 Just head out on Jaffa Road. The Jericho Road heads east, and the Hebron Road leads south. Damascus Gate, called Sha'ar Shchem (Nablus Gate), faces north. 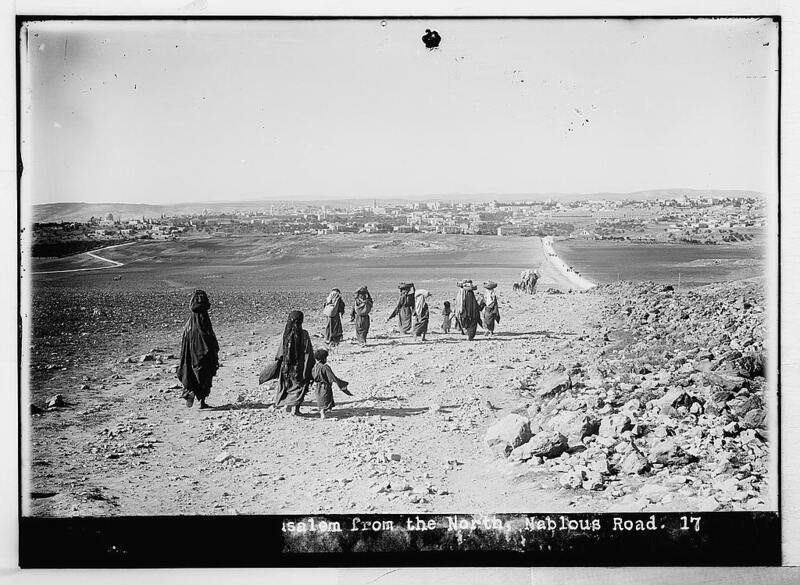 Nablus Road plays a prominent role in the Library of Congress-Matson collection, perhaps because Eric Matson's American Colony community was located along Nablus Road. The Photographer cuts off left part of photo, adds caption. The first photo (1) shows the state visit to Jerusalem of Kaiser Wilhelm II of Germany in 1898. 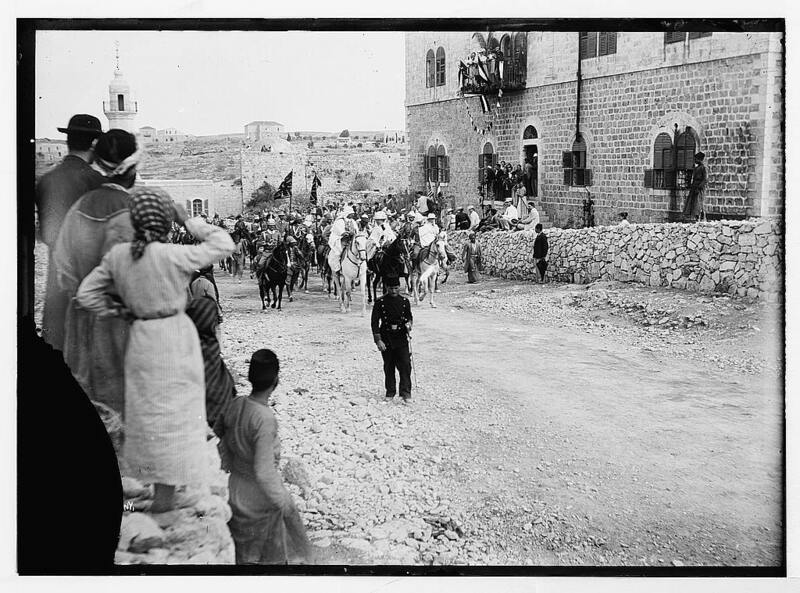 The royal party entered the city from the north, passing the American Colony building. 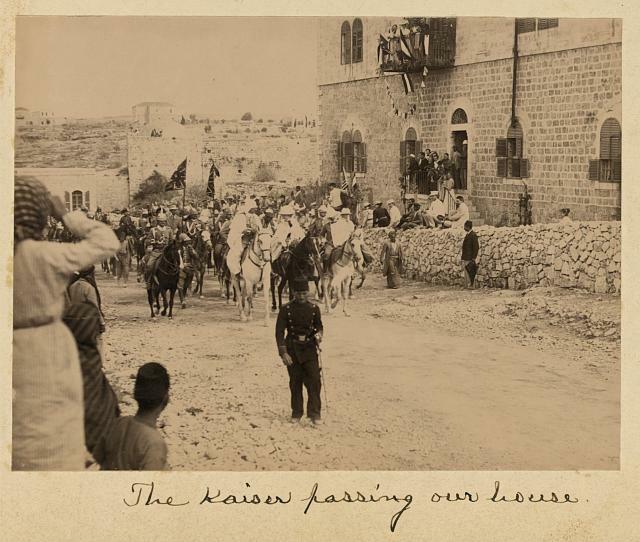 New photo added: Photographer's own caption, "The Kaiser Passing our House," but it's missing several elements on the left of the picture. 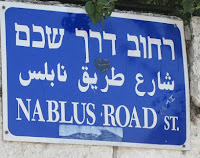 Jerusalem on Nablus Road. 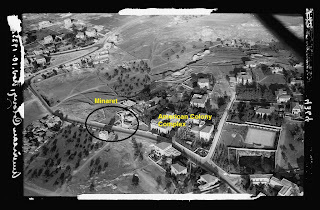 1898.
and the minaret on the left. 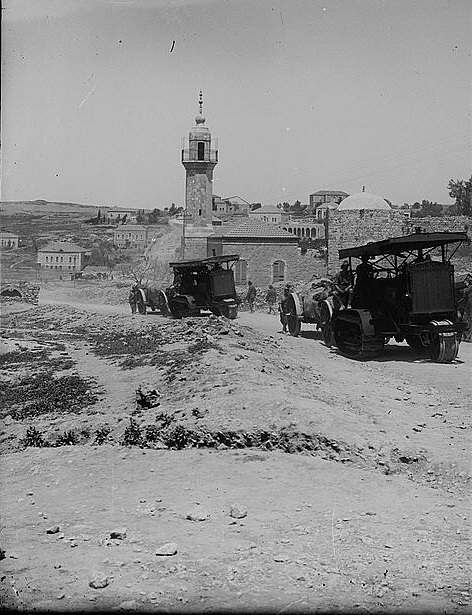 Note the minaret on the left of the Kaiser; it shows up in this second photo (2) of the Turkish army heading south on Nablus Road. 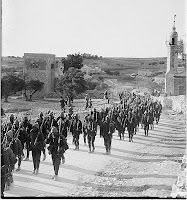 The third photo (3) is undated but is certainly prior to 1911 when a tower on the Italian Hospital showed up on Jerusalem's skyline. It doesn't appear in this photo. 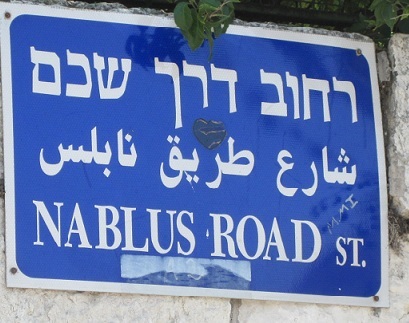 ﻿After World War I and Britain assumed contol of Palestine, Nablus Road and the route north were important for maintaining control of Palestine, particularly during the Arab Revolt (1936-1939). 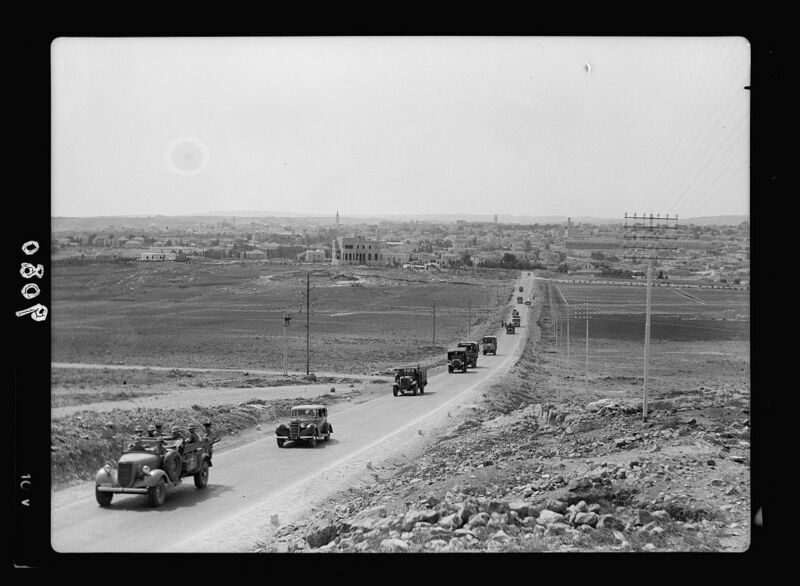 Picture 4 shows British armored vehicles providing protection to a convoy traveling between Jerusalem and Afula in 1936. The American Colony's location adjacent to Nablus Road provided its photographers a vantage point on history. 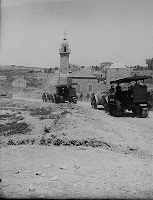 Picture 5 shows heavy British artillery being moved south on Nablus Road in 1917 or 1918. 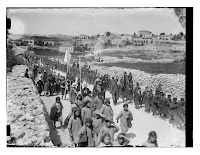 Picture 6 is a picture of Jewish children marching on Nablus Road in 1918. (An essay about the picture appears here.) 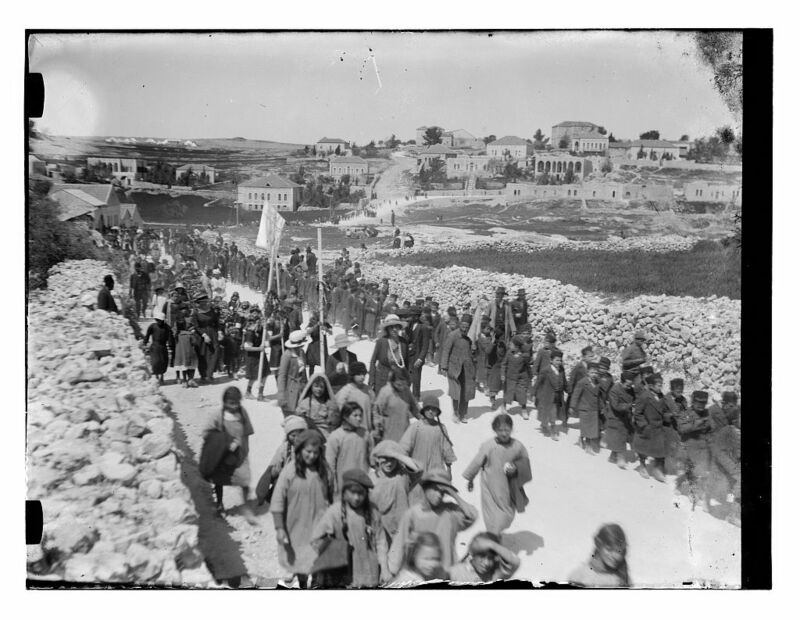 Picture 7 shows British soldiers heading north responding to Arab riots in 1920. For comparison we also present an aerial photograph of Nablus Road in the 1930s and a contemporary picture of Nablus Road. the arches had a second story added. Today it is a school.